Crossfire: Where's the Meat Balls? My 12 year old (Year 8) daughter came home from school this week with a free gift, as she described it, from a man called Ed Balls 'from the government'. It's actually quite a good cook book - packed full of simple recipes. My two daughters both cooked us the leek and potato soup for tea last night - tasted good. But it made be wonder. How does Ed Balls justify projects like this? I know from experience gained working with local government procurement people, that any proposals for significant expenditure need to be accompanied by a 'business-case'. 'Business Case' is a strange term to use for government expenditure but it describes a document that outlines, just as any business would, what the investment required is and what the forecast gains are that will be made as a result of the investment. Justification is key. The business case must stack-up. If the return on the investment is not clearly acheivable and measurable then why do it? In short there must be real 'meat' on the bones of an idea for it to go ahead. So, I wonder what the business case for this very, very expensive (ring bound, full colour, heavily 'designed', thick stock, gloss-sealed finish - you couldn't spend more money on it if you tried) publication was? I guess if some research was done that showed that young adults were ignorant about how to cook basic recipes, which in turn led to health issues which are costing the tax payer a lot of money then a 'business case' could be assembled. But surely that would just justify 'cooking' being on the school curriculum, it wouldn't necessarily justify the production of a government cook-book for kids. 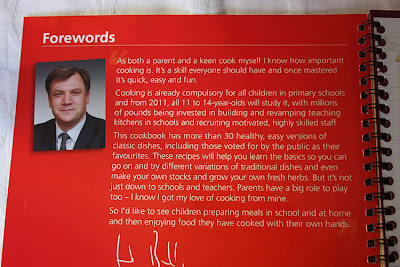 Why does Ed Balls feel the need to commission a cook-book rather than, having put 'cooking' back on the school curriculum (a move that sounds sensible to me), leave it to the teaching profession, and the highly competitive educational publishing market, to innovate the teaching aids and methods to give kids the skills to cook basic meals. But look. Maybe I am being churlish to criticise Ed Balls for what was probably a well intentioned idea. But I do want to know, when governments spend our money, on what basis they justify doing so. Government spending used to be called 'spending'. Now it's called 'Investment'. So if it really is investment then it is implicit that a return is forecast. And if a return is forecast then a justification is required for that forecast return.. just obvious, good practice. It should be an absolute requirement. Cynically though, I can't help but wonder, if in fact, there was no business-case for this publication. That's not so say there was no justification. Emblazoned across the front cover is the name of that world-renowned, nutritional genius 'Rt Hon Ed Balls MP'. Turn the page and there Ed commands page 1 with a cheeky picture, and a long 'forward' telling us what a lovely guy he is for giving every school child this free book. I bet it gives him a lovely warm feeling to think of the contribution he has made. This is Ed's legacy. It would have been nice from him to have been Chancellor but unfortunately Darling wouldn't be shifted. So Ed will have to take heart from the idea that future generations will be sustained by the recipes approved and published by him. 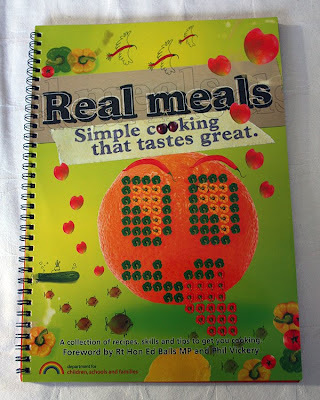 And every child, as they grow and become an adult will have a bookshelf somewhere with Ed's 'Real Meals' book on it. There's a recipe to suit everyone - a politically correct and ethnically diverse range of meals that include Spagetti, Paella, Chow Mein, Fajitas and Chicken Tikka. But there's no Meat, Balls.